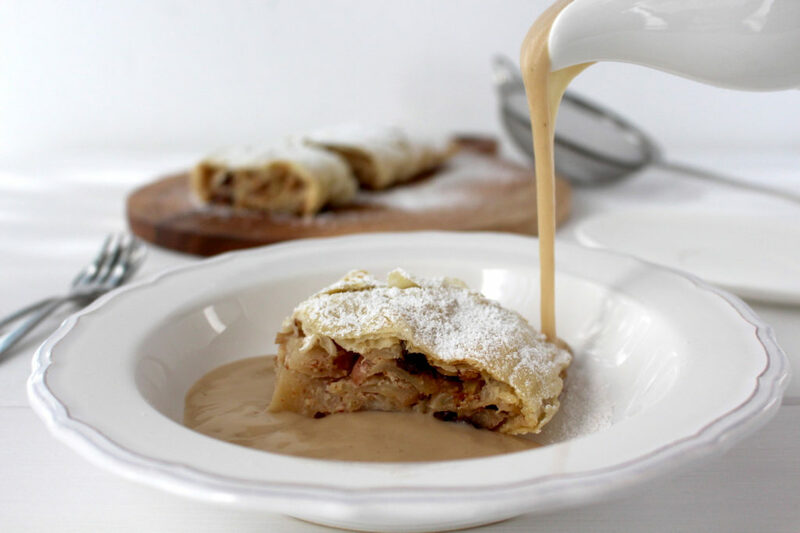 Just as the shredded pancake, apple strudel is an Austrian classic which fortunately also made it to the Bavarian cuisine and therefore cannot be missed in our Oktoberfest week here on the blog. I like it best with warm vanilla sauce which is super quick and easy to make. 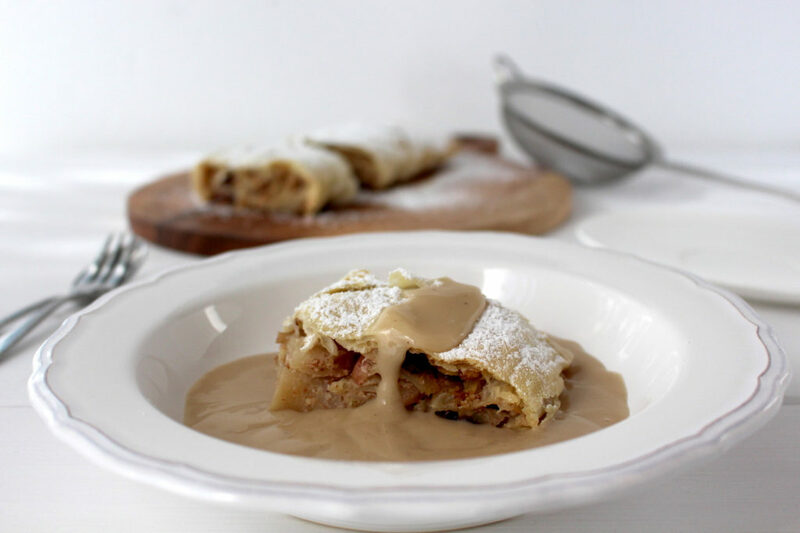 If you prefer eating the apple strudel warm, consider having it with a scoop of vanilla (n)ice cream. Yum! Strudel dough should be stretched thin enough so that you’d be able to read a newspaper through it. Admittedly, this does demand some practice – my first dough didn’t turn out perfectly. 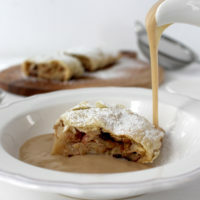 Alternatively, you can use strudel dough or even phyllo pastry, which you should be able to get at most grocery stores. Of course, you can always vary the filling according to your own taste. If you don’t like raisins – which in my opinion just comes with the territory – leave them out. You could also fill the strudel with different kinds of fruit or even savory with ingredients like spinach, potatoes – the possibilities are endless! Combine flour and salt in a bowl. Add water, oil, and vinegar and knead well with the dough hook of a hand mixer/ food processor or simply with your hands. As soon as the dough appears relatively smooth, form a ball and transfer into an oiled bowl. Turn the dough over a few times to coat it lightly with oil (this will make the dough smooth and the stretching easier). Cover with plastic wrap and refrigerate for 1 hour. In a bowl, combine raisins with rum, lemon juice, and peel and marinate for at least 30 minutes. Core and quarter apples, then thinly slice quarters again. Grind walnuts and add to marinated raisins, together with apples, shaved almonds, and cinnamon. Mix everything well and sweeten or season to taste. Line a tabletop with a tablecloth/ tea towel and sprinkle with flour. Take dough out of the fridge and roll with a rolling pin on cloth, trying to keep it rectangular. Then put your hands under the dough and use the backs of your hands (not your fingertips and nails!) to gently stretch it out. Once the dough is no longer easy to manage with your hands or seems to tear, lay it down on the covered table and use your fingers to pull gently around the edges to make sure they aren't to thick. Cut any thick excess dough, if necessary. Melt margarine and preheat the oven to 350° F (180° C) (fan oven). Spread margarine on dough. Lay out apple filling onto the bottom portion of the dough in row that's about two inches shy of either side. Fold over the edges left and right first, then carefully roll the strudel by using the fabric. Optionally spread every layer of the dough with margarine before further rolling. Lift up the rolled strudel (with the fabric) and place it, seam side down, on a baking sheet lined with parchment paper. If it's too long to fit, form it into a horseshoe shape instead. Spread with remaining margarine and bake for about 40-45 minutes. Add milk and cream to a pot and bring to a boil. Meanwhile whisk together starch with vanilla pulp, sugar and 6 tbsp of the (still cold) milk oat mixture. As soon as the milk starts boiling, remove from the stove and stir in starch mixture. Place back on the stove and keep whisking until the sauce has thickened to your desired consistency. 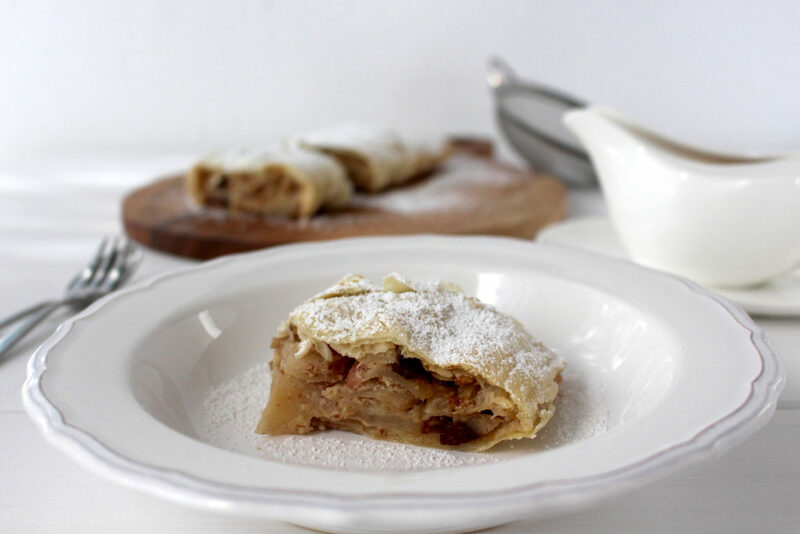 Dust apple strudel with confectioner's sugar (optional) and cut to portions. Serve with warm vanilla sauce or vanilla (n) ice cream. Liquid need for the dough can vary depending on freshness and type of flour. Strudel dough should be stretched thin enough so that you'd be able to read a newspaper through it. I hope you love this recipe – please let me know in the comment section below! If you make this apple strudel, make sure to take a photo and share it on my Facebook page or on Instagram, using the hashtag #minamadefood. Oh and don’t forget to tag me (@thisisminamade) so that I can see your creations!